Home Web Dev I’m Done Just Building Websites! 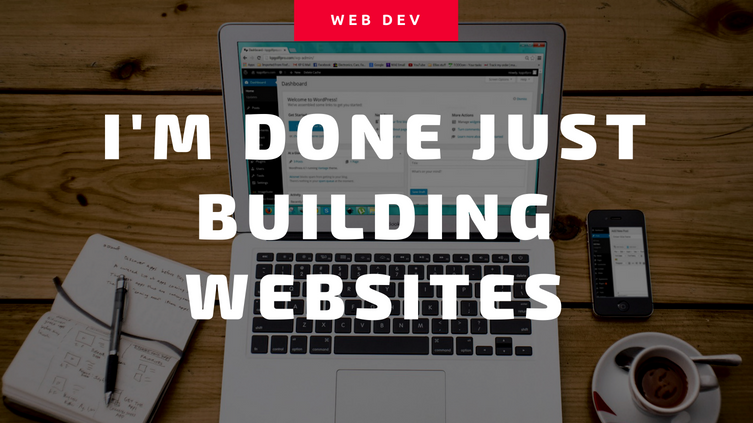 I’m Done Just Building Websites! I don’t want to build websites anymore. There, I said it. I’m tired of putting time and effort and knowledge into making a pretty little storefront or a cute little portfolio. I’ve built too many websites for small or medium sized companies or individuals which never get used. Everyone’s told that they’re supposed to have a website for whatever venture they’re going with. If you don’t have a URL to put on your business card, you’re not considered legitimate anymore. Problem is, everyone’s got a website. The thing is, not everyone has a successful website. People are missing the entire point of having a website. What is it I want to build, then? Communities. The websites that I’ve worked on that have truly been successful are based around building a community or a group of people. These communities don’t always have to be people commenting and interacting with each other directly on the website. Not every website needs to be social media web 2.0 tagging liking friending commenting in order to be a community. Some communities are based around a single voice that puts out information, like a blog or an e-mail newsletter. Some communities ARE based around people sharing and talking with each other; forums can be incredibly useful for these purposes. Regardless of the interaction, whether the interaction is one-to-many, many-to-one, or many-to-many, the website is only a tool for people to interact. So, I’m past the point where I want to just build isolated billboards in the desert. I want to build online towns and cities. Why does newegg get so much business? It’s because there’s a community of users that has grown around newegg that purchase their products. Newegg isn’t a discussion forum or a blog, but it definitely has a community nonetheless. A group of people who when they’re hanging out say “Hey, look at what I bought of newegg the other day…”. I want to build sites that are not only a joy to use, but cause people to join together. I hope that you’ll all join me.